South Australia is blessed with great wine and great cycling. So why not combine the two? The premier vineyards of the Barossa Valley are just a short hop from Adelaide and a cycle through this region is a route into one of Australia’s finest foodie hubs. In fact, there’s a winery or town every few miles, putting your taste buds in touch with hip cafés, artisan food producers and, of course, sun-soaked vineyards. It might be one of the only cycle routes where you eat more than you burn off! 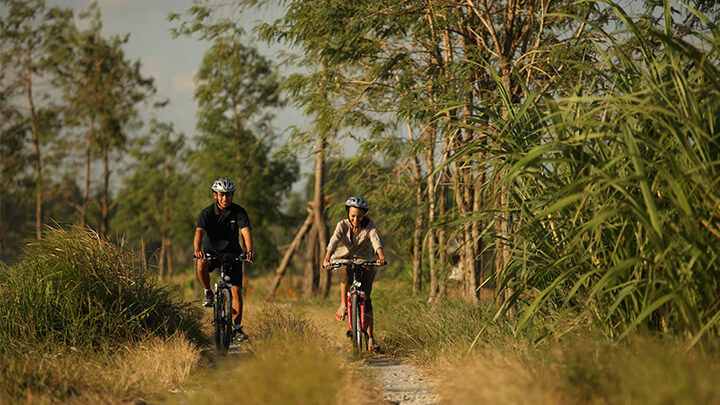 With a lush, forested interior pocked with temples and steaming volcanoes, Bali begs to explored by bicycle. Go from the top down, beginning at the stunning starting point of Mount Batur’s summit, before gently riding down its volcanic slopes. Stop off at a medley of island sights as you descend, spying traditional Balinese villages, fascinating temples and green rice paddies en route. If you fancy something a little more off the beaten track, the UNESCO-listed rice terraces of Jatiluwih are well worth a pedal. With a rich range of scenery spanning rainforest, snow-capped mountainscapes, lakes, glaciers and rolling hills, New Zealand is a nature-lover’s playground. 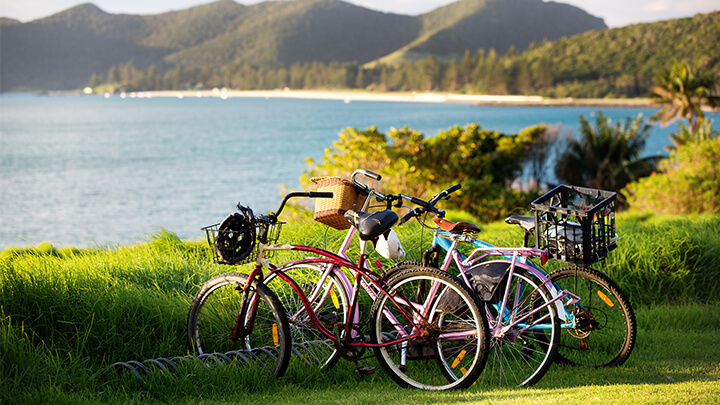 One of the best ways to soak up the country’s lovely landscapes is on two wheels, with 22 ‘Great Rides’ covering every inch of New Zealand’s natural beauty. 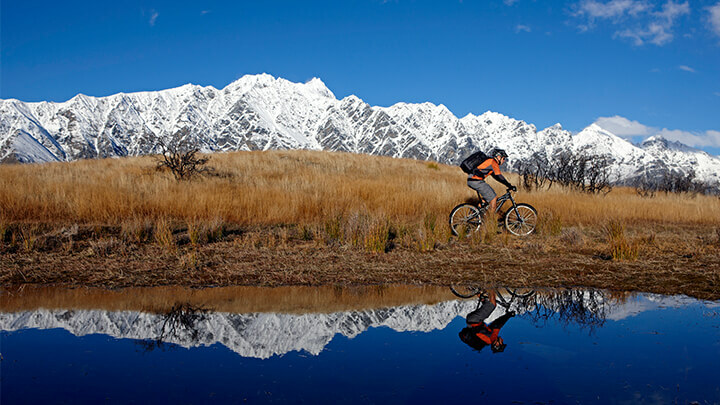 The Alps 2 Ocean trail has you whizzing down the slopes of Aoraki/Mount Cook past turquoise lakes and sleepy country towns, the trail in Hawke’s Bay traces rivers and ancient woodland, pitstopping at world-class wineries for a tipple (or three) and on the tip of the North Island, the Twin Coast Cycle Trail has you pedalling through captivating Maori history. And that’s just to name a few! Eastern Africa may be more known for its walking and 4×4 safaris, but the rocky terrain of the Chyulu Hills in Kenya is a great playground for mountain bikers. Stay at ol Donyo Lodge and weave past volcanic craters and cinder cones, while the epic view of the snow-dusted Mount Kilimanjaro looms large in the distance. 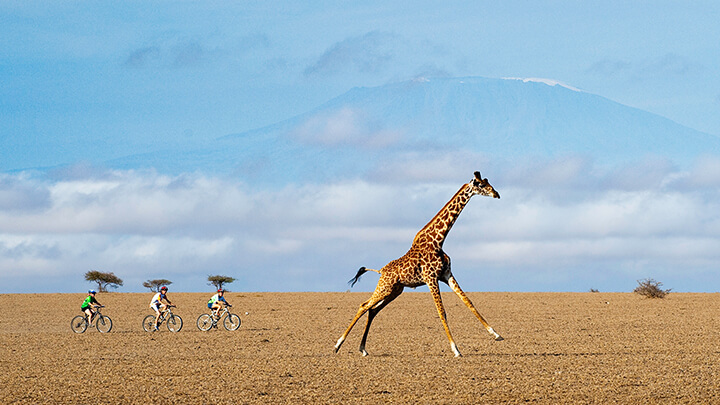 It’s a unique perspective on wildlife, too, as you can chase the shadows of birds like the crowned eagle swooping overhead and ride alongside Masai giraffe, oryx and antelopes. Few things are more iconic in the USA than the Golden Gate Bridge and the best way to cross its art deco expanse is by bike. Pedal over to the quaint harbour of Sausalito for majestic views looking back to the bridge and San Francisco, with drink in hand. 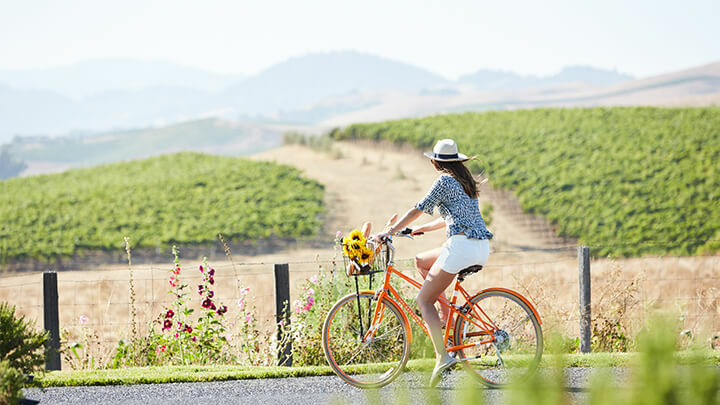 Beyond Sausalito, the renowned wine regions of Sonoma and Napa Valley are great for pedalling through, its sun-drenched vineyards a real treat on two wheels. Sri Lanka’s lush interior is filled with history, from the archaeological remains of the Cultural Triangle to the rolling hills of the Tea Country. 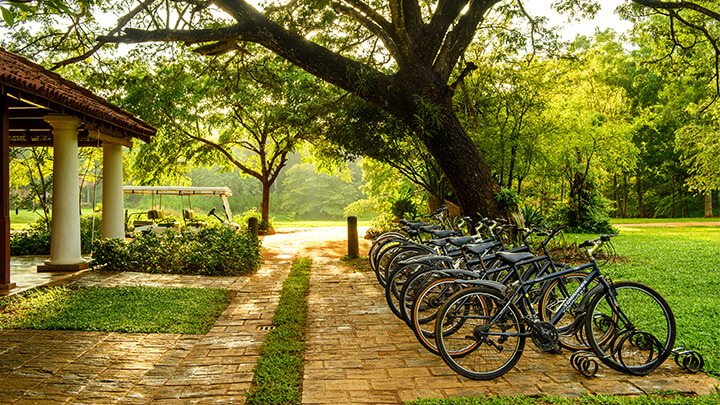 A bicycle is an enjoyable way of seeing it all, feeling the cool breeze and as you glide around the crumbling dagobas and temples of Anuradhapura and the ancient rock fortress of Sigiriya. Head south for prime Tea Country territory and its emerald bubble-wrap hills, tea estates and dreamy countryside are a joy to pedal. 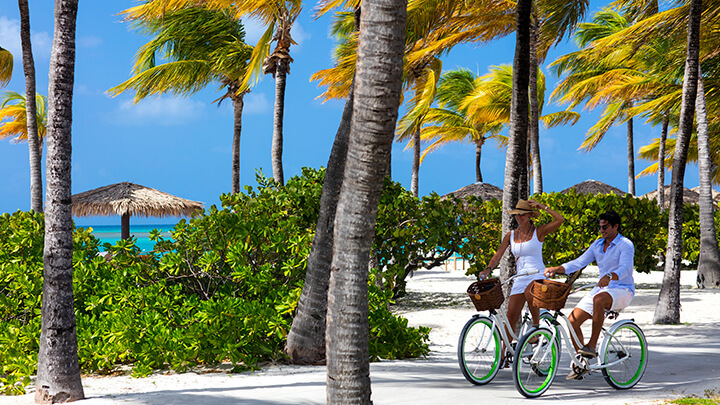 Being the adventure capital of the Caribbean, it’s no surprise Saint Lucia has plenty of cycling routes. There’s nothing quite like pedalling through thick jungle and the narrow trails which snake through Saint Lucia’s verdant rainforest put you nose-to-snout with agoutis, iguanas, and plenty of birdlife, including the Saint Lucia parrot. It passes many waterfalls, too, so there’s plenty of natural plunge pools for you to cool off in.